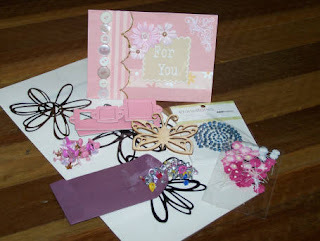 This gorgeous pile of goodies was what the lovely Anna (AKA scrapcollector) sent me for the November WOM at ALLCRAFTZ! !My first ever WOM how cool is that!! This is the card Nic showed us how to make at her PMS last night......love that technique! !I need some of that glitter!! Another non traditional coloured card......why be normal I say LOL I love this stampin up stamp !! The little bunch I made last night :) OK Im totally not a card maker but I had heaps of fun making these ones :) Thanks Nic!! Looks like we are in for another big storm tonight......hope its not as bad as they have been lately. WOW! Congrats on the goodies! :) You've been so busy making some wonderful Christmas cards!! They're all so pretty!! Love the bear!! TFS!! i don't know why you say your not a card maker cause they are beautiful...they really are great!! love those stamps too!! woohoo you did it..she is done!! josh's teacher is one lucky lady...her bear is just gorgeous!! The cards look great. I just used one of those stamps myself on Friday night (went to a SU demo). The bear is just a little bit too cute :).